Request your private van or excursion at any time - we´ll be waiting ! ! ! Tours & Transfers by Van is a private owned, personalized service dedicated to providing reliable and hassle-free travel with comfort style and ease. Tours & Transfers by Van. Offering private ride services and Excursions, from and to Cancun International Airport to Cancun, Puerto Morelos, Playa del Carmen, Puerto Aventuras, Akumal & Tulum Hotel Areas & private residences. Experience the magic of Riviera Maya and dive into the fun of Playa del Carmen. We invite you to allow us the pleasure of fulfilling all your Extransportation needs with our services. 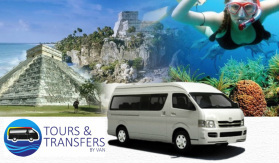 Whether you are in the Playa del Carmen or Cancun area on business or for pleasure with your family looking for the best private van service, we are here to help. Tours & Transfers by Van Transportation is the best option to airport traffic and parking madness. No lugging luggage or leaving your car parked in some dimly lit airport parking lot. No stress from driving a rental car in a strange city. Tours & Transfers by Van Transportation delivers you stress-free every time.